Custom art framing, mirror framing and picture framing are all important for effective interior decorating and design. Heritage Frame & Picture Co. provides custom framing and corporate framing for some of the top interior designers in New York City and Westchester County. One of the common items to include when designing the decor of a home, office, hotel or restaurant is the type of and style of the custom frames that will be utilized to enhance the room or area. Custom art framing is not just for professional interior designers. Even if you are a novice at choosing a custom picture frame or frame for your artwork, we at Heritage Frame can guide you through the process. Custom framing is crafted one at a time by one of our expert craftsman. Our frames are not installed at a factory or by mass machinery. Our work is hand done in our framing shop in Tarrytown, New York. Each frame is built for your unique design with high quality materials and constructed with care. Custom framing preserves your art, pictures and memorabilia, to gift to the next generation. Custom framing is great for revitalizing your current artwork, portraits, diplomas, mirrors, pictures, collectables or children’s artworks. Custom framing enhances your home, office or place of business. It also provides an opportunity to surround yourself or guests with the images and objects that inspire. With professional, custom framing, your treasured photographs and artwork become part of your interior design. Here are some interior design ideas for displaying your custom framed artworks, pictures, mirrors and memorabilia. Custom art, mirrors and pictures enhance any room. This is especially true if you choose a custom frame to complement a theme of the room or location. This is includes the color, sise, shape and style of the picture frame and the color of the matting. Picture framing helps connect pictures and artwork in the room’s theme. Custom designed metal frames work well with modern themes. Wood frames are versatile and come in such a large variety that they can be easily incorporated into any decor. Instead of displaying a group of photos, instead place a large custom framed picture or artwork on a wall to create the illusion of a window. If you have a shelf or picture rail instead of hanging art on the wall, place a group of pictures and mirrors in area. This cause people to stop and look at your display and get lost in the moment for a while. This enjoyment is relaxing and memorable. Custom framed art works well with other memorabilia and decorations. Mix framed art, pictures, mirrors and collectables with other decor such as candle, vases, plates, glasses and flowers. Interior designers know the value of custom art, picture and mirror framing. Interior decorators who provide work for corporate entities, office buildings, restaurants, hotels, banks, office buildings and residential buildings. Private art collectors also take full advantage of custom art framing. It is for these reasons that if you are interested in having art, mirrors, collectables or memorabilia installed at your home, you should have your works custom framed. Store bought frames are not of the same quality of a custom designed art frame. Heritage Frame & Picture Co. looks forward to working with you to select the perfect frame. We are experts at designing and building frames. We have been in the business for 140 years. We provide you with the guidance and can answer all your questions about corporate framing, custom art framing, art restoration and art installation. We pick up and ship your artwork, collectables, memorabilia as well as sentimental pictures throughout the United States and internationally. We provide framing for individuals, corporations, governments, museums, galleries, interior designers, hotels, restaurants, condominiums and non profit organizations to name a few. Corporate displays, photos, artwork, poster, children's art, family photos, private works, family heirlooms, sports memorabilia, college/university degrees, awards and almost any other item you choose to frame. We have a wide assortment of frames and matting to accommodate you. Heritage Frame & Picture Co. offers custom picture frames, custom mirror frames, art restoration and art installation throughout Nyack, New York 10960. Founded in 1878 in Manhattan, N.Y. , Heritage Frame is one of the oldest and highest rated custom framing shops Nyack and the United States. Ted Howell, owner and 4th generation custom framing craftsmen, has been working in the picture framing business since he was a child. As an apprentice to his father, Ted handmade his first custom photo frame when most kids were still just learning how to tie their shoes. Ted is dedicated to providing excellent customer service, the most selection of custom frames as well as the best photo and picture frames, matting and framing hardware. Though Heritage Frame’s main photo framing shop is located in Tarrytown, NY, Ted has an abundance of clients in Nyack. In addition, if you are in Nyack, New York and are looking for FREE picture and photo framing estimates, call Ted Howell at (914)332-5200. Furthermore, if you call Ted, he will make an appointment to meet with you at your Nyack home or office. When you meet, Ted will have with him a variety of picture frames, matting and hardware according to your request. As an added bonus, Ted will also show you via computer, a digital rendering of how your photo, mirror, posters, diploma, award, letter object, antiques or anything else you want to frame will look when framed. Heritage Frame may be 140 years old and established during the 19th century, but it operates a 21 century picture framing, art restoration and art installation business in Nyack. If you would like to try our online custom photo and picture framing technology, click here. Once there you will be provided with directions on how to operate the digital framing software. After you identify the picture, photo or mirror frame you would like to order, save the image and share it with Ted Howell. Ted will either meet with you in Nyack or have your picture shipped to Heritage Frame to be custom framed. The picture and photo framing business has changed since Ted Howell’s great grandfather opened the family’s first photo, art restoration and picture installation shop, NY Frame, near Wall Street, New York. The photo framing business has introduced new technology, more framing and matting options and even more conveniences.Still, what remains the same is the need for expert picture framing craftsmen, experienced art restoration experts and knowledgeable art installation technicians. These skills is what makes Heritage Frame unique and even more important to the custom framing and corporate framing industry than in 1878. Heritage Frame works with and has provided custom picture framing, restoration and installation services for Nyack interior designers, hotels, restaurants, banks, record and film companies, sports teams, art galleries, art collectors, museums, non profits, financial firms, buildings, offices, corporate events and for private art collectors. Heritage Frame works with clients throughout New York, New Jersey, Connecticut, Chicago, Phoenix, Arizona, California to name a few. Many of Heritage Frame local New York City clients are located near Nyack as well. This list includes towns in Westchester, Putnam and Dutchess County, New York. We provide custom picture, mirror and photo frames, corporate framing, art restoration and art installation for Westchester County and NYC. Pleasantville Picture Framing (10570), Tarrytown Picture Framing (10591), Sleepy Hollow Picture Framing (10591),Scarborough Custom Picture and Mirror Framing (10510), Briarcliff Manor Picture Framing (10510), Ossining Picture Framing (10562),Irvington Picture Framing (10533), White Plains Picture Framing (10602,10603) , Manhattan Picture Framing, NYC Picture Framing,Greenwich Picture Framing(10012, 10013, 10014), Stamford Picture Framing (12167), Purchase Picture Framing (10577), Harrison Picture Framing (10528), Rye Picture Framing (10580), Scarsdale Picture Framing (10583), Hartsdale Picture Framing (10530), Nyack Picture Framing (10960), Piermont Picture Framing (10968, 10976), Croton Picture Framing (10520), Chappaqua Picture Framing (10514), Queens Picture Framing, Bronx Picture Framing, New York City Picture Framing, New Jersey Picture Framing. If you are looking for custom picture, art, photo or mirror framing in Nyack NY, call Heritage Frame & Picture Co.
We give FREE photo, art, mirror and picture frame estimates and quotes. We also give FREE art restoration and art installation quotes and estimates. Our picture and photo framing shop is located near you in Nyack , New York. Hartsdale, New York is famous for many reasons, this includes one of the oldest picture photo framing businesses in the country, Heritage Frame & Picture Co.
Hartsdale residents and business owners have a lot to be proud about as they look into the town's history. As history buffs, this is one of the reasons Heritage Frame enjoys installing custom photos, art and pictures as well as restoring art in Hartsdale. Discussing and discovering more about Hartsdale and the surrounding towns history, makes each service call another enjoyable moment. Owner of Heritage Frame & Picture Co, which itself was founded in 1878, Ted Howell, a 4th generation master picture framing and art restoration craftsman, always welcomes the opportunity to discuss the vibrant history of both Heritage Frame and that of Hartsdale. In fact, he loves to share pictures and photos from "the old days" which was before Ted was born. If you would like to see some turn of the century photos and learn more about Heritage Frames' history, click here. Before we go to far, if you are looking to have your photo, picture, poster, certificate, portrait, diploma or anything else custom framed or need to have art restored or installed (commonly known as art hung) call us at 914-332-5200. Yes, we do give FREE custom framing, art restoration and installation estimates. We also come to your location and can meet with you after hours and weekends. We work with interior decorators, galleries, museums, not for profits, banks, law firms, hotels, private art collectors, office buildings and residential buildings. We are known for our expert corporate framing and for participating in corporate events where we install art, provide corporate gift framing as well as ship and secure the art so it is transported safely. We ship and pick up art from anywhere and everywhere. Please can contact us on our website by clicking here or call us at 914-332-5200 -or- 212-233-3205. Furthermore, if you would like to try our online custom photo framing system where we have a large assortment of frames, matting and hardware, please click here or go to our online custom photo framing page by clicking here to learn more. More than picture and photo framing, Heritage Frame is part of the Hartsdale and Westchester, New York community. We have served many happy and satisfied customers for almost 140 years who refer us to their friends, family and co-workers. We treat all of our customers like valued clients. In fact, Google Reviews rate us as a 5 stars photo and picture framing business. So now that we have gotten that out of the way, I want to share with you some of the great historical facts about Hartsdale, N.Y.. This rich history is one of the reasons why many photographers and artist visit, work and reside in Hartsdale. It allows them to capture the beauty of a town who still has old world charm with new world technology, amenities and flavor. The following content is a wonderful read and borrowed from Wikipedia. At the end there will be a link to the page to learn a lot more. So just remember, grab your camera, your drawing pencils and paint brushes. Capture the beauty and history of Hartsdale. We would love to design a custom frame for you to display in your home, office, business or event. Photos, art, music, buildings, architecture and antiques allow us to embrace the past while living in the present. It is also a great way to add to your interior design work, some of the past as it brings with it a richness that can only be found by going back in time. Restoring artworks, hanging them in your restaurants, hotels, conference rooms and home make great conversation pieces and help them increase in value. Hartsdale, a CDP/hamlet/post-office in the town of Greenburgh, New York, lies on the Bronx River just 20 miles (32 km) north ofNew York City. It is served by the Metro-North Harlem River commuter rail line into Grand Central Terminal. Hartsdale is the home of America's first canine pet cemetery (started by veterinarian Samuel Johnson in 1896), and the world's first Carvel Ice Cream store (1934), which closed in 2008. Hartsdale's earliest settlers were the Weekquaeskeeks (sometimes spelled Weekquasgeeks), a sub-tribe of the Algonquian tribe that lived in most of southern New York, from Westchester down through Manhattan. Weekquaeskeek is an Algonquian term believed to mean "place of the bark kettle", and this kettle appears in the Greenburgh town seal today. After the earliest British colonialists arrived, the area was developed under the manor system when Frederick Philipse, a Dutch merchant and British Loyalist, was "given" the land by the British government. As lord of his Philipse Manor, he leased his land to tenant farmers who, at least for a time, were believed to have lived alongside their Native American neighbors. There is evidence to show that Hartsdale played a significant role during the Revolutionary War, some of which still stands today. On October 28, 1776, a Revolutionary War battle was fought alongside the Bronx River, near the site of the current Hartsdale train station. The Odell House (on Ridge Road, built in 1732) served as the headquarters for the French general the Comte de Rochambeau, and is where the count and George Washington are supposed to have formed an alliance leading to the Battle of Yorktown. The house was later named after John Odell, Washington's guide who bought the house in 1785. In 1965, his descendants deeded the house to the Sons of the American Revolution, and today the house is in severe decay, awaiting funds to transform it into a museum. After the Continental Army and American colonialists won the Revolutionary War, Frederick Philipse III (third lord of the manor and great-grandson to Frederick Philipse I) fled, his land was confiscated and sold to the remaining farming tenants, many of whom were descendants of the Hart family. The intersection of Central Park Avenue and Hartsdale Avenue was named "Hart's Corners" after Robert Hart, one of these farmers who successfully bid for the land, and in the mid-19th century the entire area became known as "Hartsdale". The area remained largely agrarian until 1865, when Eleazar Hart deeded land for the development of the New York and Harlem Railroad line into Manhattan, setting the stage for Hartsdale to change into a more cosmopolitan commuter village. Between 1880 and 1940, large tracts of farmland and estates were subdivided and converted into private houses and apartments at a furious pace. By the 1960s, almost no remaining farmland was left for sale. In 1904, the successful German-Jewish banker Felix M. Warburg (1871–1937) purchased large tracts of land to build his 500-acre (2.0 km2) "Woodlands" estate in Hartsdale, a summer home next to the country club where he and his wife Frieda Schiff Warburg (1876–1958) spent considerable time. The estate would later become an important site in the history of modern American ballet, when on June 10, 1934, their son Edward M. M. Warburg (1908–1992) helped produce the first American performance of George Balanchine's masterpiece "Serenade". In keeping with the family's philanthropic efforts, Frieda Schiff Warburg, on her death in 1958, bequeathed a remaining 150 acres (0.61 km2) to the town of Greenburgh to build a public school. These 150 acres (0.61 km2) are now the home of the Greenburgh Central School District (formerly called Greenburgh Central 7 School District) and Woodlands High School. The main Warburg mansion currently serves as the school district headquarters, but other remnants from the original estate grounds can still be seen standing in the surrounding woods and neighboring streets. The Warburg family's New York City home would later be donated to become the Jewish Museum of New York. On February 9, 1928, Hartsdale made history when the Scottish inventor John Logie Baird (1888–1946) transmitted the world's first inter-continental short-wave television signal from a transmitter (call sign 2KZ) in Coulsdon, Surrey (a suburb of London) to his colleague O. G. Hutchinson in the cellar of Robert M. Hart, an amateur radio operator (call sign 2CVJ) in Hartsdale. In 1932, Henry Jacques Gaisman, inventor and founder of the Gillette safety razor blade, purchased 136 acres (0.55 km2) of land along Ridge Road, most of which he purchased from George A. C. Christiancy, son of the former U.S. minister to Peru, Isaac Peckham Christiancy. In 1952, at age 82, Gaisman married his nurse Catherine "Kitty" Vance Gaisman, aged 33, a former Catholic nun. In 1957, he and his wife Catherine (Mrs. Henry J. Gaisman) passed the title for his land to the New York Archdiocese for $600,000, with the agreement that they could live there as long as they wished. Mr. Gaisman died in 1974 at age 104, and Mrs. Gaisman remained on the estate until she moved to Connecticut in 1995. In 1999, the estate was saved from sale and development when the Town of Greenburgh acquired the property and reopened it as the Hart's Brook Nature Preserve. Part of the agreement included the preservation of some portion of the estate as a home for retired Catholic nuns. Today the Catherine and Henry J. Gaisman Foundation continues to donate large amounts of money to support medical research. WOW. Isn't that an exciting read. So the next time you need to decorate or want to display photos, artwork, old newspaper articles, letters or other antiques, you can probably find a whole assortment in your own backyard in Hartsdale. If you want to meet with us at Heritage Frame & Picture Co or would like to speak with Ted Howell, you are always welcome to call us or stop by our framing shop. If you would like to read more about the history of Hartsdale, here is the link to the page. Briarcliff Manor Picture Framing (10510) shop - Heritage Frame & Picture Co (HeritageFrame.com) offers custom mirror, picture, art and photo frames. In addition, we also provide art restoration and art installation services. Heritage Frame is one of the oldest and most experienced picture framing companies in New York. Our clients in Briarcliff Manor include galleries, interior designers, are collectors, restaurants, hotels, banks, photographers and private art collectors. If you are looking for picture, mirror or art frames in on near Briarcliff Manor, call Heritage Frame at (914)332-5200. We also give FREE framing, art restoration and art installation estimates. In addition, we make private appointments and we come to your location. If you prefer to contact us via our website, our contact page is located here. We are available to answer questions or to set up an appointment for us to meet. Feel free to come by our shop where we have a large variety of frames to choose. We work with national and international clients. We provide art installation for all types of events, corporate affairs, commercial buildings, offices and residences. We ship as well as pick up your artwork for framing. Nothing is too small or too big. To get more familiar with our services, look around our website. We have information about our history, with some fabulous photos from the 1930 -1950's. In addition, we also provide a more extensive list of services we provide under the Services tab. Many of our Briarcliff Manor framing customers have been buying art, picture, photo, and diploma frames from us for more than 50 years. during this time, we have developed a large following and great reviews. We work with some of the most successful interior decorators and galleries in New York. So, we are very familiar with the latest decorating trends and styles. In addition, we also provide custom framing technology via the internet. This allows you to take a look at how your photo or artwork looks with different frames. Online custom framing is growing and we are providing this service to our customers as a free courtesy. If you have wedding, bar mitzvah, graduation or special event photos, having them professionally framed makes a great gift for you and for your family and friends. Again, If you want a FREE photo, art frame or mirror framing estimate, give Heritage Frame a call. We also provide free quotes for hanging photos and art as well as for restoring artworks. We are often in Briarcliff Manor meeting with clients, so if you want to have us set an appointment to meet with you there, we welcome the opportunity to serve you. Ossining Picture and Mirror Frame shop, Heritage Frame & Picture Co. , has the largest variety of wood, silver, gold, museum quality, metal and antique frames in NY. Heritage Picture and Frame Co. located in Tarrytown, NY provides custom picture framing, mirror framing, art restoration and art installation for Ossining residents and business owners. Many Ossining art collectors, business owners, interior designers and families recommend Heritage Frame and have done so for more than 75 years. In addition to being located near Ossining, Ted Howell, owner and master frame craftsmen, makes private appointments where he meets with you at your business or home. Heritage Frame is one of the few custom picture framing companies that makes house calls. Determined to provide excellent customer service, Ted has continued the tradition started 140 years ago by his great grandfather who opened the families first shop in lower Manhattan. Since then, Ted has now taken over the family business and believes providing a quality product with excellent service, Heritage Frame can one day be passed onto his children as it was to him. 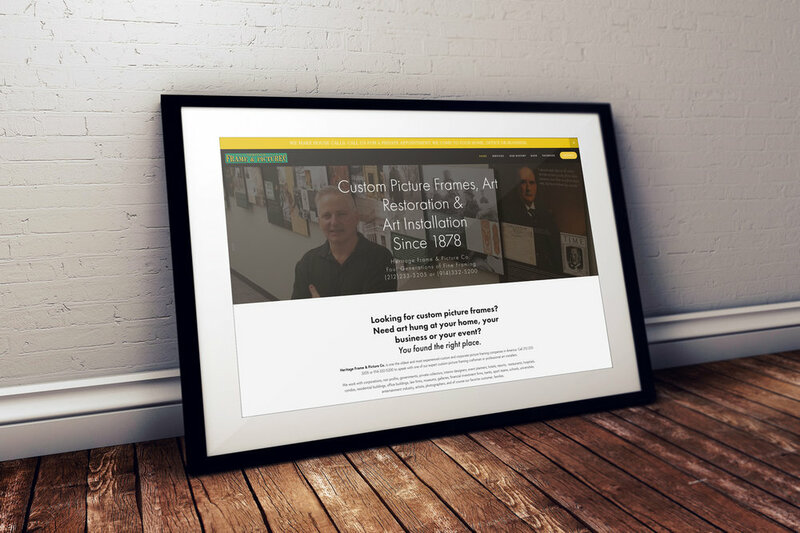 As the framing business has grown and technology entered the picture and art framing business, some things began to change. Some of the changes are the lack of expert custom framing craftsman. Expert craftsman like Ted understand the value of selecting high quality wood and metals along with equally high quality matting and hardware. Today, many mass produced frames are made with cheap plastics or compressed wood and do not enhance the art, photo, portrait, diploma, poster or memorabilia within. Instead, these low quality retail frames cheapen the art and do little to preserve its original condition. What is rarely know is that in some instances, the picture frame is an essential part of preserving the art so the are is not subjected to the elements. In other cases, the picture frame is chosen to capture the ambience of the room, home or business in which the art or mirror is hung. so, the frame selection and quality are essential. Furthermore, the frame is just as important as the picture. Yes, there are many discount frames that can be bought online as well as at the local Walmart, Michael's, Target and mall. But, these frames are not of the same quality, look or feel as a custom wood or metal art or picture frame. We believe, the frame is as important as the art. They complement one another and this relationship between the two is inseparable. Even when re-framing, which is the removing of an old frame, one feels some attachment to the old frame. This is because the frame is in many ways part of the experience. Over the years, we have worked with many interior designers, galleries, artists , collectors and photographers in Ossining. During this time we have heard the stories of why the art was chosen, who the people are in the portrait or even the journey of obtaining the diploma or degree. It is these stories that make our job memorable. Our framing shop being conveniently located near Ossining means many of our clients come to our shop in Tarrytown to see our new frames and to learn about the picture framing process. Maybe we are a bit sentimental, but for us at Heritage Frame, each picture, family photo, artwork, diploma, poster, memorabilia, mirror or object we frame has a story attached to it and we work with that in mind. Framing, art restoration and art installation is more than a business. It is our expression of service and art appreciation. We understand a picture hung on a wall can be there for many years to come. During this time, it is making a statement. As the quote says, " A picture paints a thousand words." Furthermore we feel a picture can touch a thousand lives. So if you need your family portrait, artwork, diploma or other collectible framed, know that with us, it is in good hands. By the way, we pick up and ship everywhere. We treat your art and photos with care and make certain it is protected in transit and when it arrives at our framing shop. Again, if you are looking or searching for a picture or art framing shop in or near Ossining NY, Heritage Frame is the one to call. We give FREE picture framing estimates as well as FREE art restoration and art installation quotes. Please call Heritage Frame at 914-332-5200. Ted Howell is always available to speak with you and answer your picture framing questions. He can also schedule a private appointment for you to come to the shop or for Ted to meet with you in Ossining. Thank you for learning more about Heritage Frame & Picture Co. We have lots more to read about here on our website, including about our history, our online custom framing technology and the many services we offer. Fee free to download our brochure here. Our contact page is located here. Tarrytown has one of the oldest framing and art installation shops in America. Heritage Frame & Picture Co. picture and photo framing shop located at Main Street, Tarrytown, NY 10591 has been in business for 140 years. Heritage Frame also known as NY Frame opened their first custom picture framing, art restoration and art installation shop in Manhattan , New York in 1878. Since then, this 4th generation framing business has evolved under the ownership of Ted Howell, the great grandson of the founder. Mr. Howell has built a business with customer service, high quality picture and mirror framing. In addition, he has expanded his service of restoring artwork and has developed a relationship with interior designers, photographers, art galleries and private art collectors. Furthermore, Heritage Frame makes private personal appointments. Ted Howell, will meet you at your home or place of business including after hours or weekends. Heritage Frame is the highest rated and most experienced Picture Framing shop in New York City, Westchester County and within the five boroughs- Bronx, Brooklyn, Manhattan, Queens and Staten Island. They install art and provide custom picture, art and photo frames for banks, law firms, restaurants, art galleries, hotels, sport teams and the entertainment industry within New York, nationally and internationally. If you are looking for a custom picture framing, mirror framing or photo framing shop in Tarrytown, NY 10591, call Heritage Frame & Picture Co at (212)233-3205 or (914) 332-5200. Heritage Frame gives FREE Custom Picture Framing, Art Restoration and Framing Installation Quotes for residential, retail and corporate customers. In addition, there is a variety of wood frames, antique frames, silver frames and museum quality frames at our Tarrytown shop. If you want a private art installation, custom framing or art restoration appointment, feel free to call us or make an appointment on our contact form here. When you have artwork, photograph or a painting, you will wish to hang them up in your home, office or business. A custom picture frame lets you decide on what type of frame you want and a design which blends perfectly with the decoration of your home or business environment. Compared to frames which you can purchase in a store, a custom frame offers you a lot of options from which you can choose, so you don't end up with the same designs around every picture. Our custom picture frames services involve selecting the right processes and materials to ensure that your items are protected for a very long time. We also assist in the installation of the picture frames in homes and offices. If you have any questions relating to the frame, we can be of help. Our job is to enlighten you on how to preserve your items for very long periods, and our methods are also tailored to meet the specific needs of the items you wish to frame. The methods we use vary depending on the item you want to frame. Custom picture framing of items of low value can be done to make them permanent while those of high value are mounted using a method where they can be removed without affecting the value in case it needs to be sold. Making the custom picture frame will require you to give us certain information and specifications on the type of frame you have in mind. Other choices will be made based on the decisions of the professional framers. Some of your choices may be based on cost, but we do our best to make use of high-quality materials no matter the specifications you give. Once you have given your preferences, our professional framers take your tastes into consideration and bring out carefully selected materials for you to make your choice. The frame material, the quality, color, and the number of mats to be used. All these are important as they can add certain effects to the item you intend to frame. In NYC, our custom picture frames stand out for the high-quality finish we use in our frames. Although it is optional, we enlighten our customers on the importance of glazing on any item that is to be framed. Glazing protects the artwork from forces of nature like temperature, and it is vital especially in custom frames where the value of the item to be framed should not depreciate. We provide quality custom frames in Manhattan and other areas of New York. Installation of the frames also includes consultation on the best location to fit the frames in your home, office or business. Our services extend to restaurants, offices, interior designers, hotels, private art collectors, and corporate events. We offer custom picture frames to any location within NYC, and we also perform deliveries to locations around the globe.